There are many great comedies when it comes to live theatre. Some of my favorites which come to mind: Something Rotten!, The Book of Mormon, Spamalot, and A Gentleman’s Guide to Love and Murder. I’d be happy to see any of these shows at any time, and I know I’d have a blast. Yet, I can’t remember a show that has made me laugh as much as The Play That Goes Wrong. Two acts, 1 hour and 53 minutes total, and non-stop laughs throughout. The fun actually starts before the show even opens. The premise of this hilarious play is that it is actually a play within a play. The Cornley University Drama Society is putting on a production of The Murder at Haversham Manor – what is supposed to be a dramatic murder-mystery. As you are seated, there are crew members (Ryan George and Ka-Ling Cheung) from the fake play walking around, inspecting the set, and interacting with the audience. It is a fantastic way to stay entertained until showtime. Once the actual show starts, hilarity ensues and it is non-stop laughs for the rest of the evening. When they call it The Play That Goes Wrong, they really mean it! From problems with the set to missing props, bad line readings, things breaking left and right. Anything that could go wrong does during this faux production. The entire cast is magnificent. The play’s director, Chris Bean (Michael Keyloun), explains the troubled past of the company. But he promises that this will be their best show yet. It begins with the discovery of Charles Haversham’s (Benjamin Curns) body, which of course is supposed to lay still – but is constantly getting tripped over and disturbed. His best friend (John Rapson) and Butler (Evan Zes) discover the corpse, and frantically try to figure out what to do. Meanwhile, Charles’ fiance (Ruth Pferdehirt) makes her way into the room and is driven to one of her wild fits. 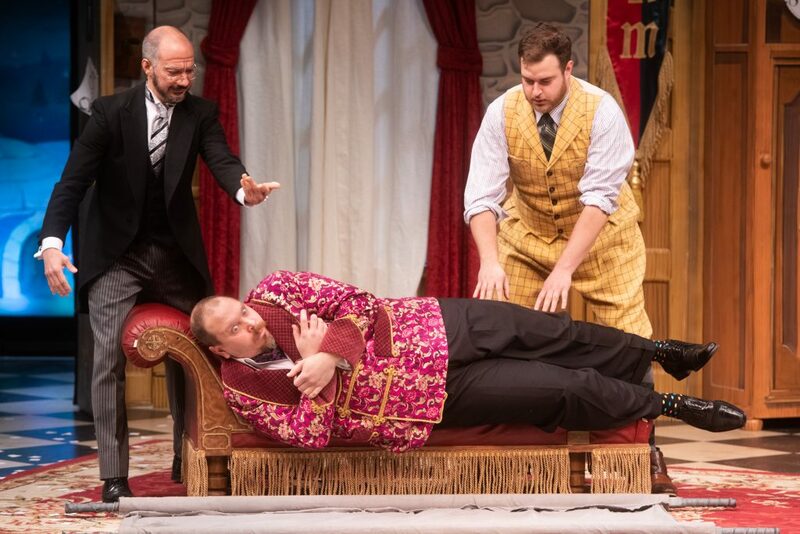 Charles’ brother (Matthew McGloin) is next to discover the body, but the character who plays him seems more interested in the audience reacting to him than his performance. This is all meant to be a part of this wonderful show. And did I mention everything goes terribly wrong? The entire time? 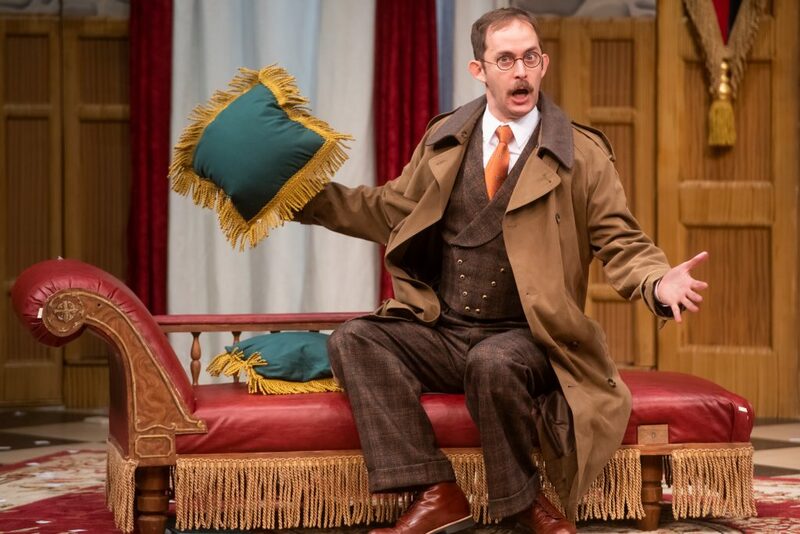 Eventually, an inspector is called to the house, once again played by Michael Keyloun. He’s portraying a Sherlock Holmes or Hercule Poirot type (and the fake play is modeled after Agatha Christie’s Mouse Trap). As calamity ensues, as it often does in this play, the actor who is portraying the fiance is knocked unconscious. Annie (Ka-Ling Cheung), the shy stagehand, is forced to fill in – which leads to a hilarious performance by Cheung and several fantastic interactions with the other actors). I don’t want to give away much of the plot or any of the surprises, but what I can say is that everything you could expect to go wrong does. And I’ve never laughed so much without a break at anything. The set not only looks incredible but has to be extremely versatile and functional. Credit goes to Peter and Margery Spack, who have crafted some of the most fantastic scenic design I have seen. It’s one thing to design a great looking set, but another to purposefully craft it to fail at extremely specific times. Some of the ways it moved and disassembled itself were mind-blowing. The show is directed by Melissa Rain Anderson, with wonderful costumes by Lauren T. Roark. Lighting Design by Kirk Bookman, and Sound Design by Rusty Wandall. Believe me when I say that this is one of the funniest shows you will ever see. The multiple layers make the show fascinating from beginning to end, and everyone involved is giving it their all. 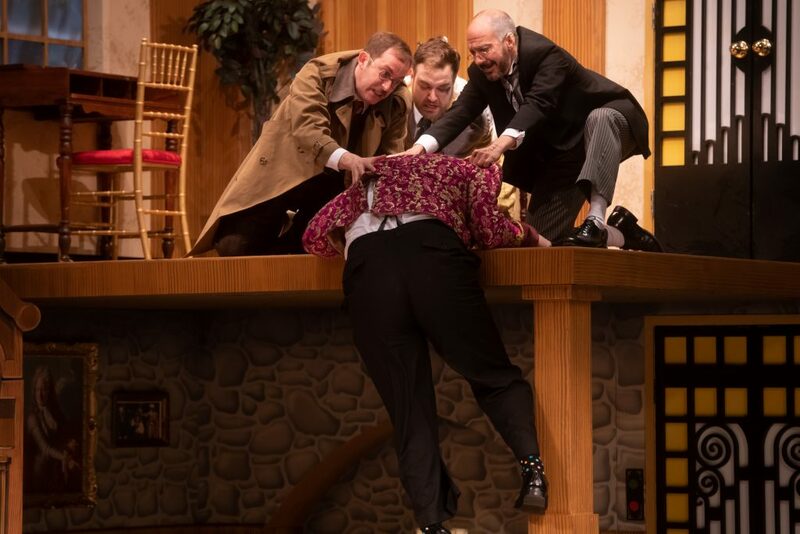 There’s nothing else quite like The Play That Goes Wrong – and watching a disaster unfold never felt so right. 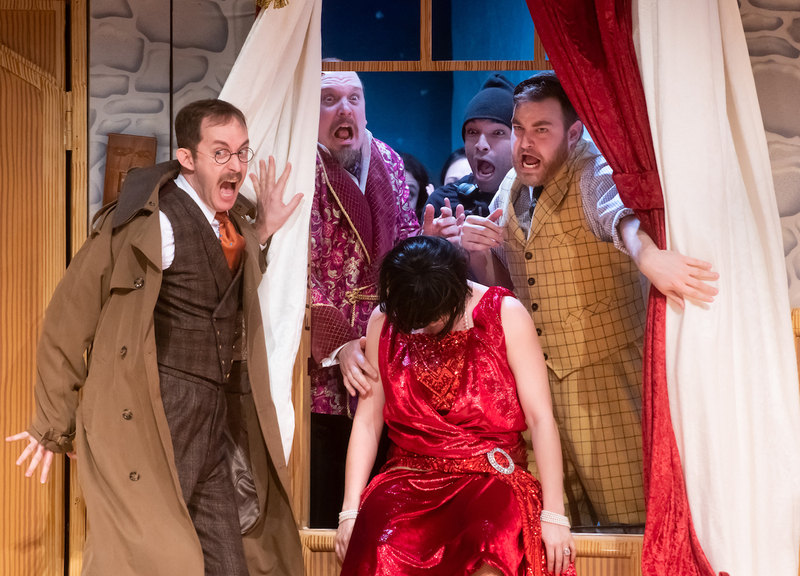 See The Play That Goes Wrong now until Sunday, April 7. For tickets and more information, visit repstl.org.